Every major stock market index in the world is down this year. Some are down more than others, but you'd be very hard-pressed to find an index that isn't down at least 40% on the year. The global financial contagion has negatively affected practically every country in the world. Real estate is down pretty much across the board. The price of oil is down. Commodities are well off their highs. The list of maladies that have negatively impacted markets around the world goes on and on, and no one has emerged unscathed. If you are living in the United States, then it can be pretty easy to think that the US stock indexes have taken the largest beating of any other in the world. You are inundated with negative news on a daily basis, and it seems as though the Nasdaq, DJIA and S&P 500 keep sinking into a bottomless pit of despair. This is certainly true, but at least two major market indexes have fared worse. Much worse. 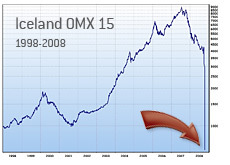 Let's start with the Iceland OMX 15 Index. This index, just one short year ago, had a value of 8,209. Today, the index has fallen to its current level of 675.31. That represents a drop of over 90% in just one year. Iceland, which was previously one of the richest nations in the world per capita, has now been forced to beg for money from the IMF and Russia. Iceland was essentially bankrupt until a $6 billion dollar loan was organized by the IMF and other central banks. The value of their currency plummeted and many citizens of Iceland were completely wiped out in the market crash. Icelandic banks, already loaded with debt (their banks apparently had six times the annual GDP of Iceland in debt), collapsed when the global credit contagion hit. The residents of Iceland turned from princes to paupers practically overnight as their stock market collapsed and their currency plunged. A once-mighty country had fallen with a speed that surprised even the most cynical of market observer. Russia, one of the countries that first offered to help Iceland, has been suffering their own misfortunes as of late. Russia, a resource rich nation, was riding high off of soaring commodities prices. When the global credit contagion (and subsequent plunge in commodities prices) hit, Russia took it squarely on the chin. The RTS Index (RTSI), which had been trading at 2,132.39, has now fallen to just 665.78. Oil, which had been at one point trading at around $150 a barrel, plunged to under $70 in just a few months. Russia's stock market rises and falls with the commodity market, and the impending global recession meant that demand for commodities would fall sharply. The Russian stock market fell, and many investors worldwide pulled their money from Russia and instead put it into a safe haven - the US dollar. For all of the problems in the United States, investors worldwide feel that the US will lead the world out of this global funk. Other countries have been hit particularly hard as well - the names that jump out are Argentina, Hungary and possibly even Korea. The Merval Buenos Aires (Argentinian stock exchange) is currently trading at 940.82 after hitting a high of 2,354.730 earlier this year. Argentina is suffering through their own parcel of problems, and the decline may not be over for that country. Iceland and Russia are likely leading the pack through when it comes to the most severe market declines over the course of the past year.